3) The crafted, “glove for your feet” style. And I’m not referring to the ones with toes, although they do fit this category. Of those, I’ve run in them all and found I prefer number 3, with a lot of fun to be found in number 2 (love my Luna Monos). Number 1 is phoning it in most of the time, and I find it interesting that the majority of big name companies who tried to jump on the bandwagon have jumped right off in search of the next thing they think will make them money. The quintessential “foot glove” style, outside of the 5 fingers (which I found incredibly uncomfortable for my feet, your mileage may vary) was the Merrell Road Glove. This was the shoe that first got me running the way I do now, and I still own a pair several years later. I ran trails, I ran road, the thing was solid. My review is here. It was pretty close to a perfect shoe. Enter the SKORA Core. You’ll be excused for blinking a couple times. The look is, to say the least, unique. Oddly, while initially you might think “oh, a fashion queen shoe”, actually the “weirdness” is all function. Did I say weird? I meant… not weird. Picking the shoe up you notice a couple things. It is light, but feels like you could put it through a wood chipper. It is made of goat skin leather which, if you weren’t aware, is tough stuff. (And don’t worry vegan folks, there’s non-animal sourced versions of their shoes). The leather is ventilated, with a mesh underneath. It is difficult for me to describe the build quality here. Think bespoke. This shoe isn’t built, it is crafted. Putting it on feels a lot like putting on a pair of old, worn in leather gloves. It wraps, it hugs the foot. The burrito style tongue feels awkward for the slightest second until click, it locks in perfectly under those offset laces. Inside, the shoe is soft. There’s room for your toes to spread out, but the rear-foot grips your heel nicely. You can choose to run an insole or pull that out and enjoy a bit more volume and the finished interior. I chose the latter, since my foot has some weird bumps that prefer room to move around in. Pulling the insole also brings you closer to the sole of the shoe. Initially I was worried, it looked soft. Like… really soft. Then I read stories of people getting 500 miles in their Cores. 700. Nearly a thousand. It soon became apparent (once I began running in them) that the shoe is laid out to favor a forefoot strike, and the place you land is a wide, solid and tough bit of rubber. Combined with the goat skin, this could be the last running shoe you buy for a while. A long while. 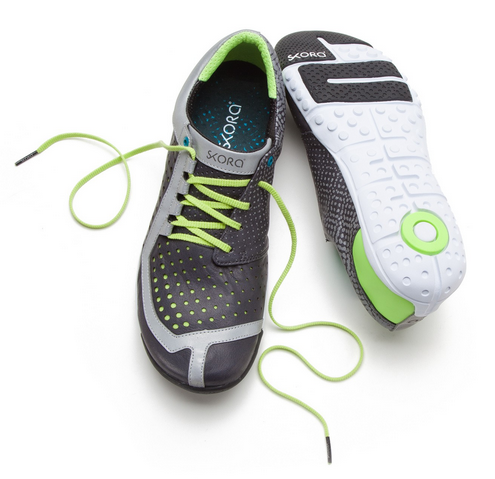 SKORA went further than just making a shoe that was durable & felt great to run in though. They also went for safety here. 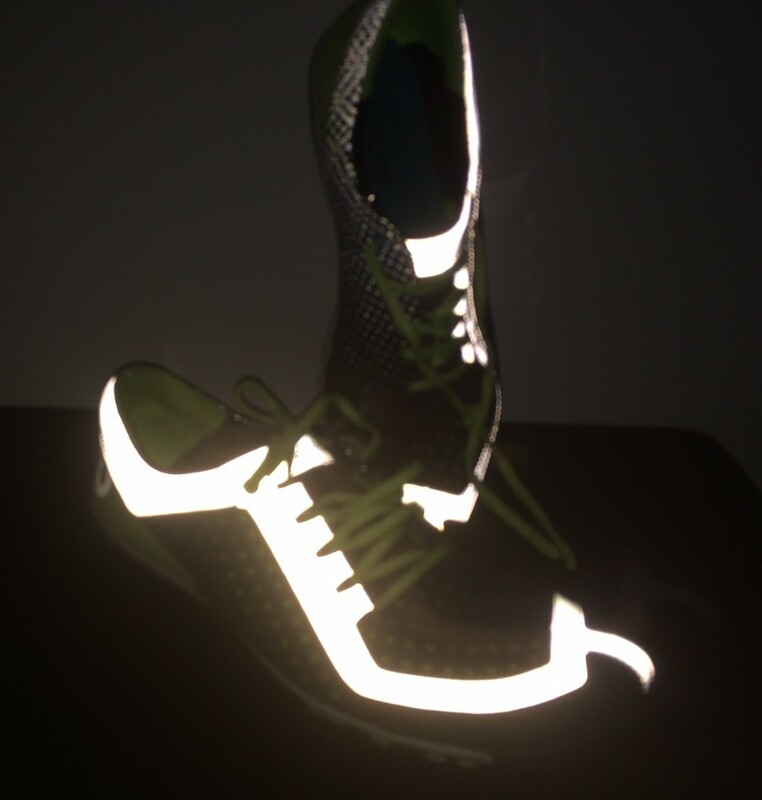 A super reflective band runs all around the shoe, giving it a very Tron like quality. Personally I dig it. My wife, less so. Still, they have a wide variety of styles, including stealthy black shoes, pink, camo and others. Pretty sure you will find something that strikes your fancy, design wise. This is the minimalist shoe all grown up. There isn’t a millimeter on there that screams “cheap”. It is like the interior of a Bentley in shoe form, and I mean that as highest possible praise. At first I had some trepidation about giving this shoe such a glowing review. SKORA provided it to me free of cost to run in & review if I felt like doing so. I also have an affiliate account with them, and sell their shoes in my store (though honestly, I haven’t sold one yet in there). It almost felt disingenuous to say “hey this free shoe I got that I also sell is amazing please buy one”, since the possibility of personal gain was there. But you know what? This shoe delivers. It is freaking gold. I would put these pups up against any competitor because it would dance circles around them. As far as I can tell, the only shoes on the market today that come up to the level of the Cores are SKORA’s other shoes. Here’s the catch, of course. With premium quality comes premium price. These shoes are not, by any standard, cheap. You’re unlikely to find them in your local Large Sports Chain Store on clearance. In fact, I’ll just say it, you WON’T find them there. Period. But, spiraling into the great pit of cliche, you absolutely get your money’s worth on these. 50+ miles in and I could basically return these as new. They scoff at wear, and the goat leather gets more comfortable everyday (which is amazing, since they’re already comfy out of the box). And then there’s the per mile factor. Sure, they’re $150. But spread that across 500 miles? Or 700? Honestly, bargain. There’s not a lot of shoes you’ll get 500 miles out of. Based on stories I’m hearing, that’s a common distance, with others getting even more. So? Durable. Beautiful. Crafted. Comfortable. Worth it? Hell yes. And if you want to not buy them from me, I fully understand. But still, buy them you should. Full disclosure: I was provided a pair of Cores to test out for a potential review. I am also an affiliate of SKORA and earn a small commission if you buy shoes using that link above. This in no way changes how freaking rad these shoes are. 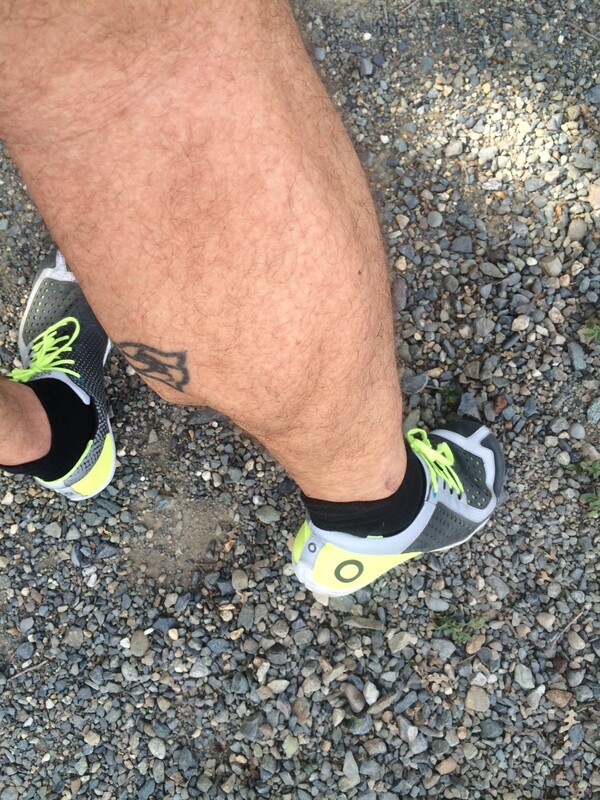 This entry was posted in Gear Review and tagged Core, drop, Fitness, Merrell Road Glove, minimalist, running, shoe, SKORA by TheFatPanther. Bookmark the permalink.